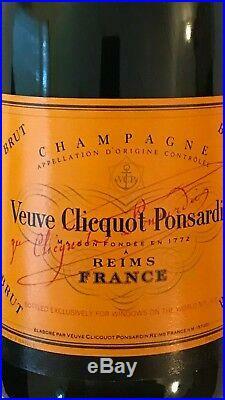 Extremely Rare "Windows On The World" Trade Center 25th Anniversary Veuve Clicquot Ponsardin Champagne. 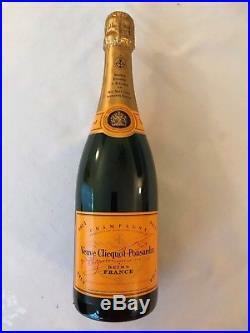 This is a bottle of Veuve Clicquot Ponsardin Champagne, bottled exclusively for the Windows On The World restaurant in Tower One of the World Trade Center. It has been stored horizontally in a controlled wine cooler. The front label is marked in red that it was bottled exclusively for the restaurant. 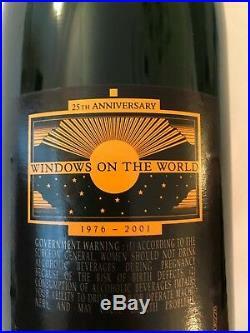 The back has a label with a nice image commemorating the 25th Anniversary of Windows On The World. The bottle is 12 1/2 tall, with green tint. 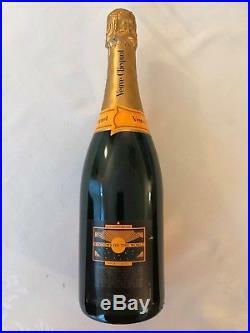 Windows On The World Trade Center 25th Anniversary Veuve Clicquot Champ" is in sale since Thursday, January 3, 2019. This item is in the category "Collectibles\Historical Memorabilia\Fairs, Parks & Architecture\Buildings". The seller is "jkacek" and is located in Lake Bluff, Illinois. This item can be shipped to United States.